The rise of Web 2.0 has pushed the amateur to the forefront of public discourse, public policy and media scholarship. Typically non-salaried, non-specialist and untrained in media production, amateur producers are now seen as key drivers of the creative economy. But how do the activities of citizen journalists, fan fiction writers and bedroom musicians connect with longer traditions of extra-institutional media production? This edited collection provides a much-needed interdisciplinary contextualisation of amateur media before and after Web 2.0. Surveying the institutional, economic and legal construction of the amateur media producer via a series of case studies, it features contributions from experts in the fields of law, economics and media studies based in the UK, Europe and Singapore. Each section of the book contains a detailed case study on a selected topic, followed by two further pieces providing additional analysis and commentary. Using an extraordinary array of case studies and examples, from YouTube to online games, from subtitling communities to reality TV, the book is neither a celebration of amateur production nor a denunciation of the demise of professional media industries. 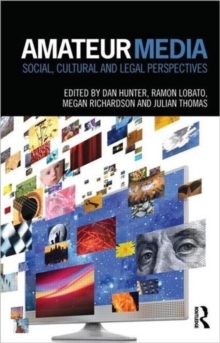 Rather, this book presents a critical dialogue across law and the humanities, exploring the dynamic tensions and interdependencies between amateur and professional creative production. This book will appeal to both academics and students of intellectual property and media law, as well as to scholars and students of economics, media, cultural and internet studies.